Red Eagle Creations -Embroidery, Screen Printing, Signs & Banners; hats, shirts, jackets & more Awards; custom tack, blankets & sheets, hay bags, totes and duffles. We offer in house embroidery & screen printing services including digitizing. Pick from thousands of stock designs or send us your logo and we can put it on just about anything; hats, shirts jackets, duffles, horse blankets and much more! We offer a variety of awards for your club, school or business. From jackets, directors chairs, western picture frames, bronc halters, tack, golf bags & sports bags, just to mention a few. Red Eagle Creations offers custom tack as well. We carry quality Parker Nylon tack, as well as leather tack, custom crystal conchos. Wether its a custom bronc halter your looking for, or custom stirrups, we can do it. Don't forget about the horse blankets, dog blankets and collars, hay bags and saddle covers. We offer both Western and English options. 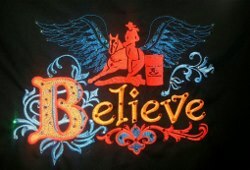 Red Eagle Creations started out making rodeo and show shirts. Just about any color shirt you want, pick your designs, ultrasuede fringe or no fringe. We can bling it out with swavorski crystals. Need your sponsors put on it, no problem. Check out our custom rodeo shirts! Red Eagle Tshirts , Tanks, sweatshirts, hoodys,and much more . 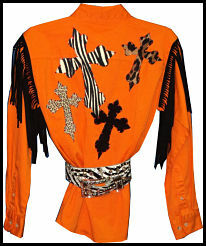 Burnout shirts with crystal designs, barrel racer, crosses, fleur de lis and many others. Kids clothing also. 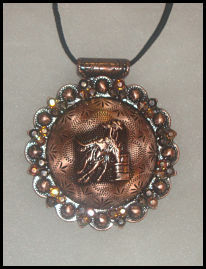 Browse through our crystal concho jewelry, hats, visors and blingy flip flops. 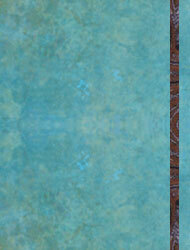 Ranchhouse picture frames, western mirrors, western towel sets and more. Don't forget to check out Bandit Bob!